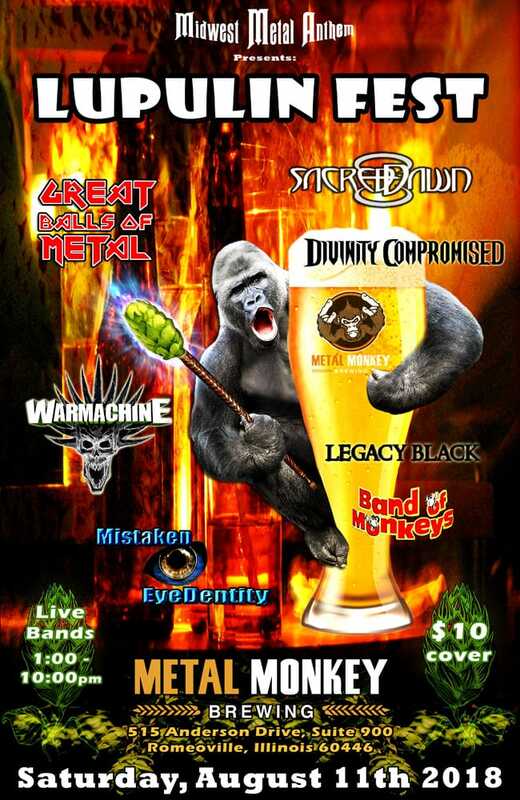 Chicagoland’s finest metal acts & great craft beer brought to you by Midwest Metal Anthem & Metal Monkey Brewing! Festivities start at 1:00pm and will go to 10:00pm. This year we’re welcoming Divinity Compromised, Great Ballz Of Metal, Legacy Black, Mistaken EyeDentity, and Band of Monkeys. Sacred Dawn will be performing their Gears of the Machine album in its entirety, and Warmachine will be joining us all the way from Toronto, Ontario! We’ll also have a rotation of food trucks serving throughout the day/night.ROGUE Farm to Curbside Kitchen, Bricks Wood Fired Pizza – Naperville, Ayalas Empanadas, Choppa Hog BBQ and Carnivale Food Truck will all be here. Come on out and join us for an unforgettable fest! Blankets and chairs are allowed. Metal Monkey Brewing is not responsible for lost or stolen items.